Smart bettors have already taken advantage in this one. The line opened at Chargers +3.5 in many places, and has been bet down to +2.5 – which means that wagerers might be able to win both ways if the Chiefs wind up winning by a field goal. And that’s very possible. All that aside, Kansas City needs this one to keep pace with Denver and Oakland in the ultra-strong AFC West. 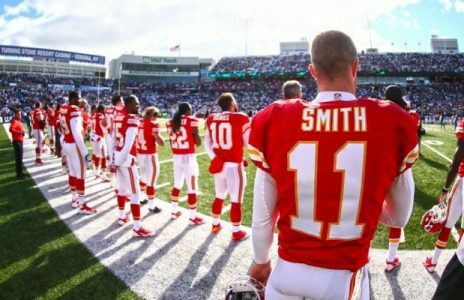 In fact, it’s imperative that the Chiefs avoid any leaks over the next three weeks because of a sadistic five-game (Pittsburgh, Oakland, Denver, Dallas, Giants) gauntlet that stares them in the face stating in mid-October. Now’s the time to take advantage of the Chargers, who are reeling after losing in their home opener to Miami before a lot of empty seats in their first game since moving from San Diego. Heavy line on this game, the product of the Texans’ poor offensive performance in Cincinnati last Thursday and the Patriots’ 36-point output at New Orleans on Sunday. And also lots of uncertainty, especially considering the Patriots’ mounting injury problems on both sides of the ball. Just when NE seemed to have figured out what to do in Julian Edelman’s absence, other wideouts have gone down, further reducing Tom Brady’s options. And now comes word that LB/DE Dont’a Hightower (hurt knee in the opener vs. KC) has been seen by Dr. James Andrews – and it’s rarely good when your name and Andrews are mentioned in the same sentence. Might be a good idea to cool on this one until the injury reports are announced and we get some kind of idea what the Pats will have on the field. Looks like the Raiders are going to have one of their best teams in recent memory just as they get set to jump ship to Las Vegas. The competition (Titans, Jets) hasn’t put up much of a fight, but it’s the NFL and the Raiders have 71 points on the board through two games. Derek Carr is off to a terrific start (5 TD passes and the third-ranked QB) through two games, and Washington has not shown a lot so far this season. Washington is average offensively, but should put some points on the board in what has the look and feel of a high-scoring game unless there are significant weather issues.